This is exactly what’s happening with the tournament I am playing in (except second “sometimes”). This Sunday I played and guess who was my opponent? The son of the guy I played with a week before ( see my previous post ). Of course, I was White again and of course, he played Scandinavian defense. What I thought when I was accepting the same freaking Portuguese variation ? second – he shouldn’t be as experienced as his father. Maybe he isn’t, but his rating is 160 points higher. Anyway, I didn’t get into that kind of trouble as last time. I successfully avoided king-side attack and even had euphoria about getting 2 bishops, but then I got into different trouble, my queen-side lagging in development. It was another theoretical move, that I didn’t know. I heroically struggled, again spending a lot of time. It reminded me later my former countryman – GM Kramnik, getting into prepared novelties in the same variation twice in the current match with Anand. Finally almost everything was exchanged except R+B vs. R+N and pawns. And here I made a mistake and lost a pawn, but recovered after that, winning his pawn and finally getting into B vs. N with a passed pawn on king-side and 2P vs 3P on queen-side. The hope returned, but I had only 5 minutes left. I made a move advancing the pawn and setting a trap, he didn’t bite, played another move ( which I didn’t see ) and I lost my pawn. I think, I could draw even then, but time was going and having less than 90 seconds on the clock I missed a fork. I would probably lose by time anyway, he had a huge advantage here. Probably I made a mistake by completely stopping my blitz activities on FICS and got out of shape, but most importantly, I realized again that my endgame technique is not acceptable. If you know how to play, you can play fast and you can win. 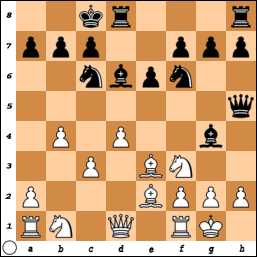 I found a very similar endgame by Capablanca-Corzo, 1901, pretty famous and another B vs. N endgame by Kramnik. I swore, that I will memorize at least the first one, all 59 moves, though it wouldn’t be as easy as many years ago. I am slowly recovering from the devastating loss that I had this Sunday. I played in my local club, it was a guy about the same age as me, rated 250 lower. I had White and he played Scandinavian. I don’t quite like to play it, because usually it gives kind of easy piece play for black, also they bother my d4 pawn. Though, I held my own well playing my only OTB game with it against almost 300 higher rated guy and getting a draw. “The resulting play is sharp and trappy. An added benefit is the newness of the line, which came into prominence only in the early 1990s. Therefore many players of White can still be caught unaware, falling victim to an early knockout”. This is exactly what happened. 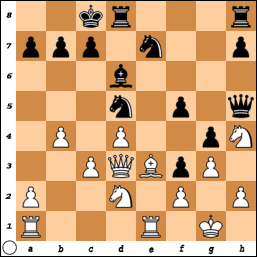 I spent a lot of time on the opening, finding the right moves. The guy moved fast, looks like he played quite a few games like this one, I spent essentially more time then him. I was fighting on the enemy’s territory. When I thought it’s time to attack, he suddenly created a mate threat. I didn’t like h3 because of possible Bxh3 (not sound, of course, but I don’t like to defend such positions), so I played bad move g3, of course right after that I saw obvious Nbd2. After 14. … f5, White were -.77. The move looked like a placeholder, just putting the pawn on important square, so I thought I got a break, played Rac8 and was shocked by f4!. I don’t understand why I didn’t see it, as I made same move myself in the past (see for example post here about Marshall attack). It didn’t help, of course, that I didn’t have enough sleep the whole week and probably played too much correspondence chess, so I didn’t feel “fresh” when I came to play. After that I lost a piece and the game went downhill. I resigned after 28 moves. So, what can I do rather than just feel awful? I learned about that variation and I am playing a correspondence game with it right now. Also, I realized that you shouldn’t be trying to find good moves in the opening your opponent wants you to play. I actually did what Kramnik did twice in a row. Try to shift the game into the familiar direction, if possible.